Somewhere in time, nine U.S. Presidential assassins and attempted assassins--each from a different point in history--cross boundaries of time and space to arrive at a carnival, managed by the Proprietor, the deux ex machina of their darker personaes. 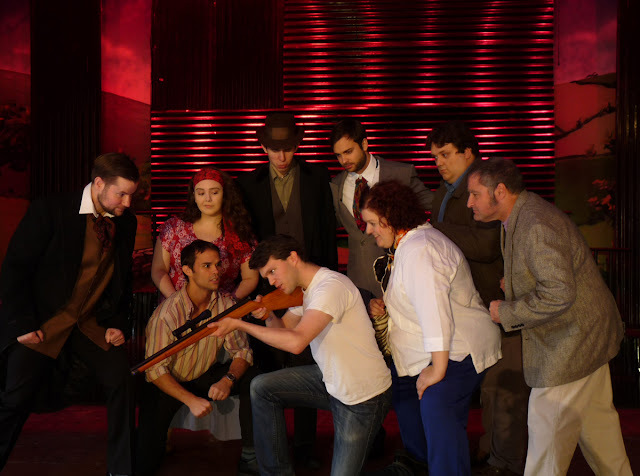 The Proprietor sees their motivations, pulls the strings, manipulating them to commit the assassination they only contemplated before that point. Here, each assassin has the ability to influence the other. Here, each assassin can tell his or her personal story. The collective consciousness of America is personified by The Balladeer, who tells the perspective of the nation... how each was viewed, how these individuals must have been insane to harbor such fantastical thoughts that assassination would somehow have the desired impact they sought. Meanwhile, the assassins tell their stories. To hear them explain it... the goal which each assassination was to accomplish would fulfill their personal American dream: to make physical pain disappear, to gain relevance, to justify his/her own abilities, to further personal promotion or achieve some larger political gain. Each convinced themselves that only assassination of an American President could allow that to occur. This tour de force musical looks how we define ourselves as individuals, as a nation, and the interpretation of the American Dream, even during his worst hours. 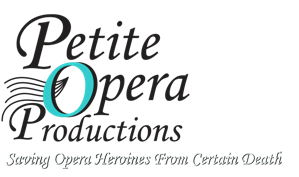 Call 847-553-4442 or email tickets@petiteopera.org to reserve your tickets for payment by cash or check at Box Office on performance date. For credit card orders, visit our PURCHASE TICKETS page. Please note: reservations and Credit Card orders accepted up to 4 hours prior to show time. A convenience fee is applied to all credit card orders at checkout.